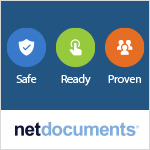 NetDocuments, the fastest growing cloud document management platform for lawyers, announced today the release of ndMailTM. Created from the ground up, ndMail makes it possible to manage the client electronic matter file exclusively in the NetDocuments cloud. Relying on machine learning insights from content in the electronic matter file for your client or project, filing recommendations are immediately suggested. ndMail can also map Outlook folders to NetDocuments filing locations. NetDocuments ndMail is setting a new productivity standard for email management with machine learning using existing matter content, a global filing indicator and folder-mapping for mobile filing. 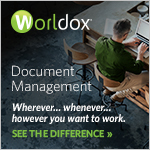 “NetDocuments has combined the management and governance of content with content understanding through our ndIntelligence Fabric. We have a clear vision: our cloud-scale, machine learning platform can massively streamline how legal teams will manage the electronic file. ndMail is one example. The next release of our web interface in April is another example of how machine learning will drive productivity,” Peter Buck, VP of Product Strategy at NetDocuments said. ndMail enters beta in February with general availability in March. NetDocuments is showcasing ndMail at LegalTech in New York on January 30 – February 1, 2018. Information and demo session details. For more details about ndMail and to subscribe to product updates please click here. Please register for the upcoming ILTA webinar on February 14 at 12PM ET, highlighting ndMail functionality and the power and efficiency of predictive global filing.